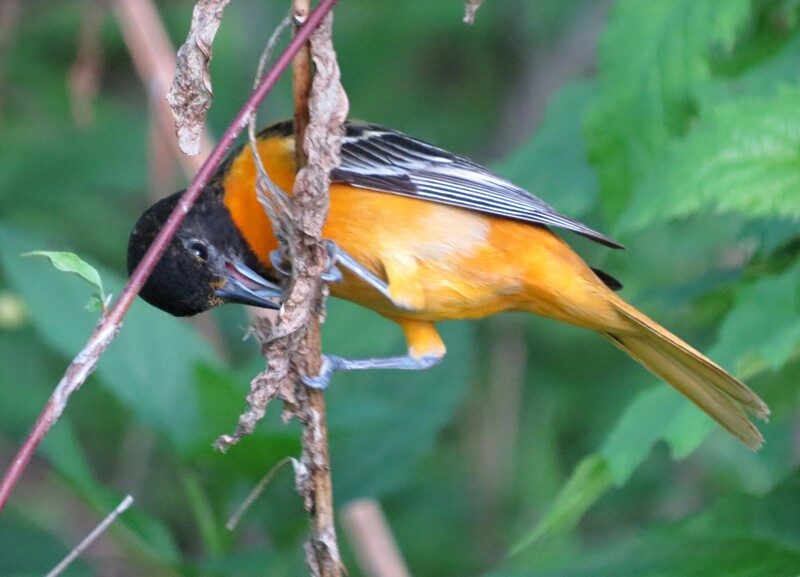 At just over 15,200 acres the five main wildlife areas and two state parks of northwest Ohio along Lake Erie, the birder has endless possibilities to search out and hopefully find that one elusive bird. Starting in the west with Maumee Bay State Park and ending in the east at East Harbor State Park, (which in itself has wonderful birding opportunities) we can’t forget Mallard Club Marsh Wildlife Area, Cedar Point National Wildlife Refuge, Metzger Marsh Wildlife Area, Ottawa National Wildlife Area and finally Magee Marsh Wildlife Area. Except for Cedar Point N.W.R. all other are open to the public. And in the short time I was visiting I was able to do a little birding at all, even Cedar Point as Jon and myself stood on the border with the refuge as we walked the border line with Mallard Club Marsh. For most of the year except a certain times Ottawa NWR can only be accessed either on foot or bicycle. And at 6,500 acres this is a sizable refuge to get around on foot, and my bike isn’t built to off-road on gravel roads. So you wait for when they open up the auto tour. This gives the birder a lot of flexibility to drive a little, park their car and do some birding as long as you don’t wander too far from your car. You could spent the whole day here, which I’ve done in the past. 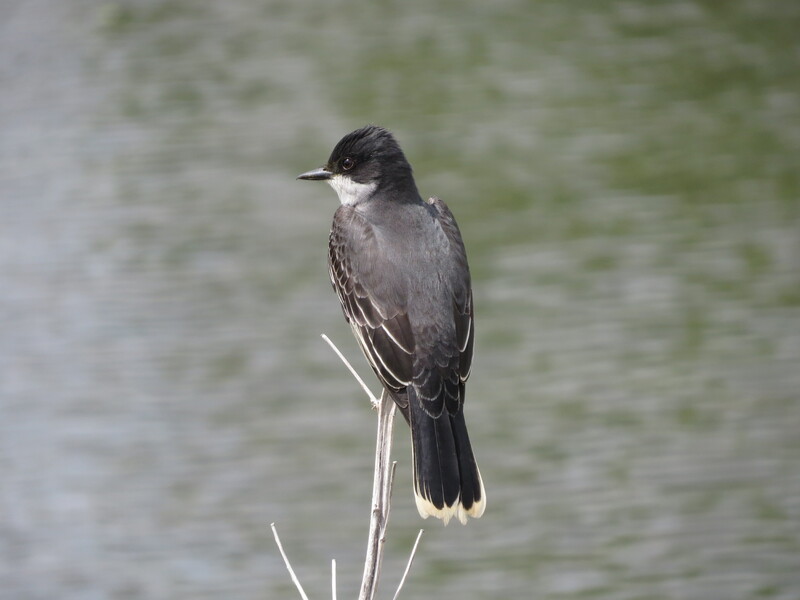 The past few years when Kathy and I visited it was more of a leisurely birding trip. We’d go visit some sights and do things Kathy likes to do since she’s not really a bird watcher. She appreciates them, but not at the same level I’m at. So this trip since I’m all alone it gave me more freedom to travel far and fast, and bird from sun rise to sun set. As you drive from one spot to another you have to remember that some of the best birding can be right along the road your traveling on. 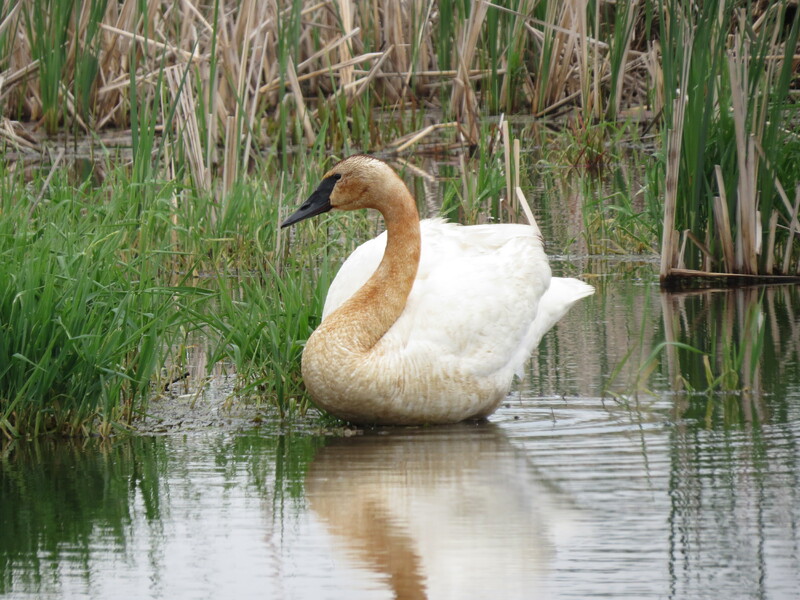 Large open fields can hold sky-pools that offer some really great shore bird habitat. 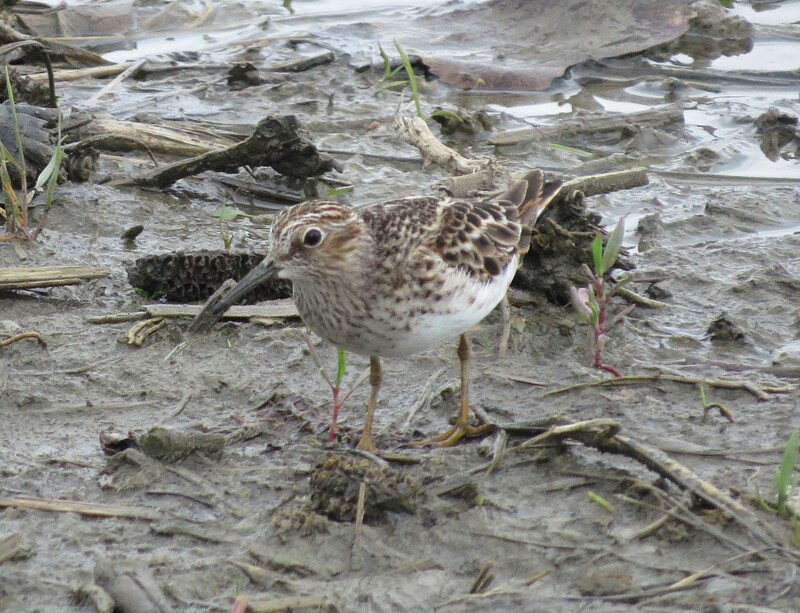 This Least Sandpiper was found at such a place next to a Marina. Sandhill Cranes have a very distinct call, and I fist heard them calling while on the boardwalk at Magee Marsh. 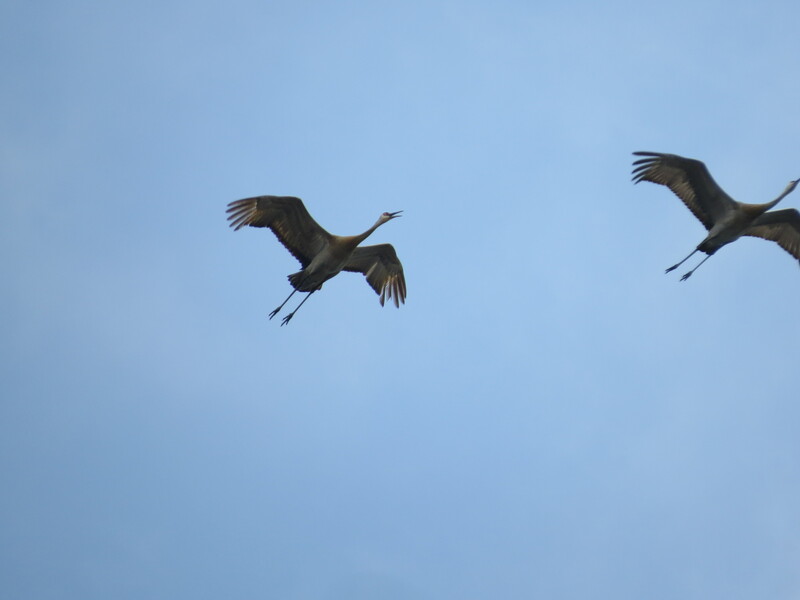 It wasn’t till I was at Ottawa NWR on the last day I heard them overhead. 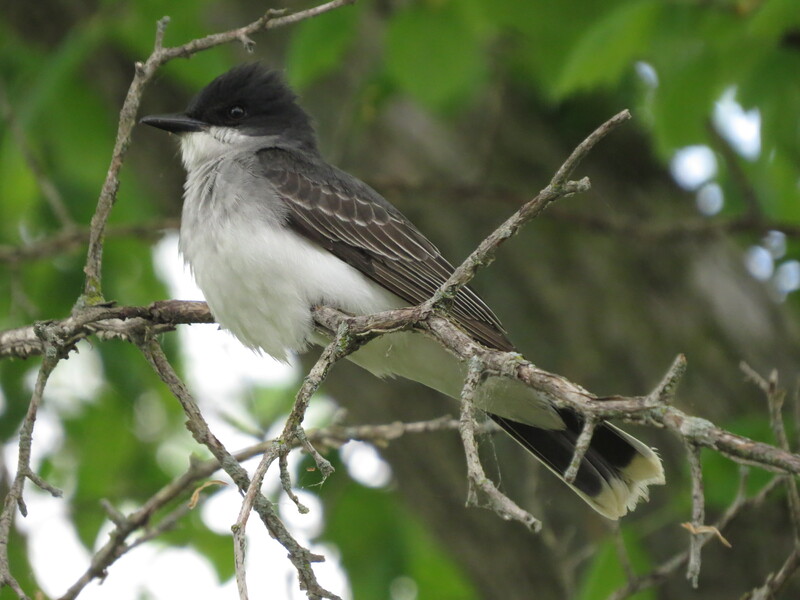 I can’t seem to get enough of Eastern Kingbirds. These 2 photos were taken while I was in my car driving through Ottawa. But sure as anything if I’d had gotten’ out of the car they would have flown off. 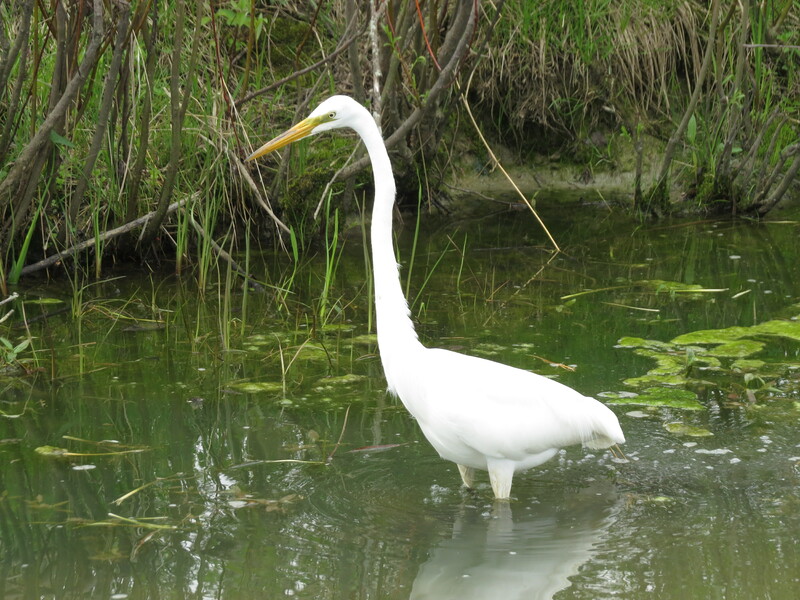 And we’ll end this short blog post with a token photo of a Great Egret, another bird that can easily be approached while in your car. 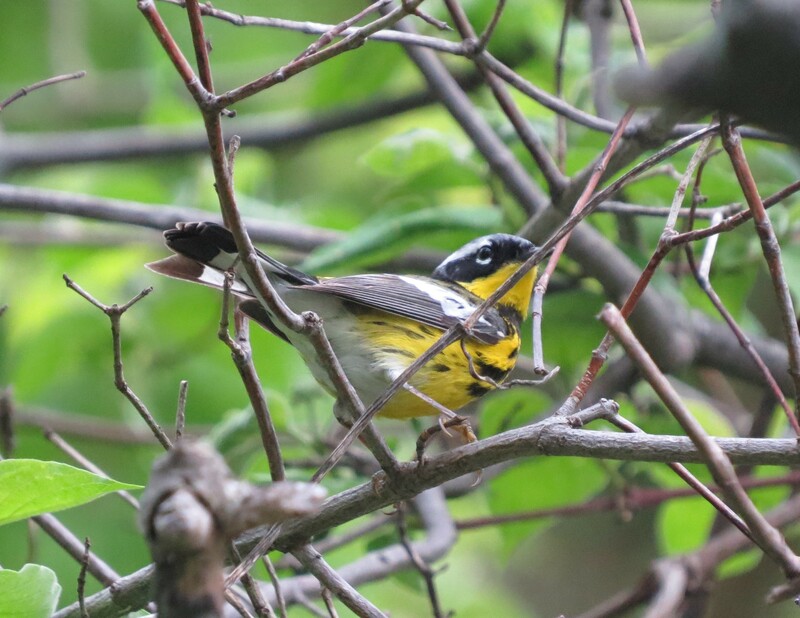 Birding in northwest Ohio during the Spring can be a phenomenal experience for the beginner or the experienced birder. Hotel and camping options are plentiful, with special rates for festival goers. Driving distance between all the parks and wildlife areas mentioned are manageable. From the cabins at Maumee Bay State Park to my hotel in Post Clinton, it was an hour drive. 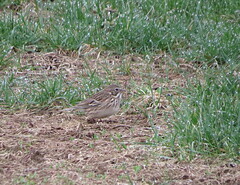 So you see it’s a relatively small area with a large amount of potential for birding. Everything I could possibly need was packed into the back of the bird-mobile. A rolling suitcase with all my necessary clothes and do-dads. Another rolling suitcase with all my optics, cables and connectors, and one field guide. A small cooler with enough peanut butter and apricot preserves to make 6 sandwiches, Fiber-One bars, and kettle cooked potato chips. My typical birding breakfast and lunch when you’re on the go. Tripod and a pillow, and that’s only because I hate hotel pillows. So at exactly 2:25 last Friday, with my I-Pod on shuffle, I pulled out of work on my way for my annual pilgrimage to Lake Erie for some serious migration birding. I was tired, but stoked. It was a long week at work and the idea of driving for several hours wasn’t exactly what I really wanted to do. What I really wanted was to take a nap. But birds were calling and being a careful driver I put the cruise control on and pointed the car north. And in 3 1/2 hours exactly I was turning off Highway 2 into Magee Marsh, and the prospect of some great birding. Birding predictions were pretty sketchy as to whether birding was going to be good, or great. As we all know the weather plays such an important part in bird migration, and as I walked onto the boardwalk Friday in the early evening it looked like it was going to be a great weekend. And then it seemed the bottom fell out. 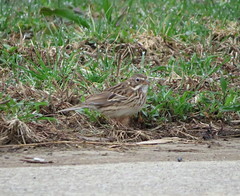 There must have been movement overnight and the birding wasn’t as good as I’ve experienced in the past. 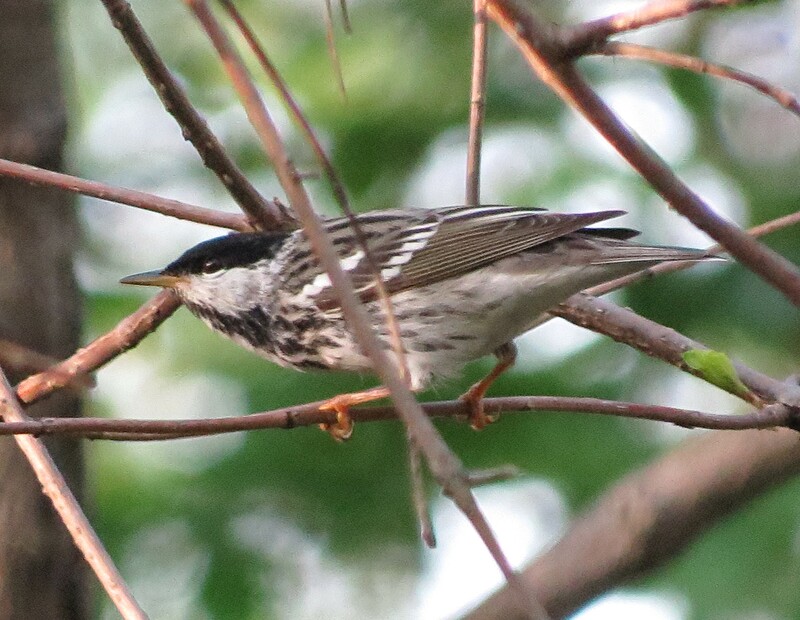 I’m sure for the most part birders had to work pretty hard to check off birds for their trip list, and i was no exception. Don’t take me wrong, we had a fairly good variety of birds, just the sheer numbers were lower that I’ve seen in the past. That’s migration for you. I birded till about 7:30 and then made my way over to Port Clinton for a dinner of some fish tacos at the Jolly Roger Restaurant, and checked into my hotel for a good nights sleep, since 5:00 am comes way too early. I have to beat the morning crowd of birders and mega-photographers to the boardwalk, plus having a close parking spot pays off big time when and if it starts to rain, and your rain jacket is still in your car. It was a 45 minute drive to the turn off into Magee Marsh and the sun was just starting to rise. I slowly crept over the causeway pausing to listen for Rails and Bitterns. Except for the half dozen or more cars in the parking lot the boardwalk was just how I liked it……quiet! It was the last full weekend for the Biggest Week In America Birding Festival, and it can get kind of noisy at times on the boardwalk, so getting there early can be a benefit when you’re birding by ear. Within 30 minutes the parking lot really starts to fill up, as does the boardwalk. House Wrens were also plentiful as they chattered away. Jon was already up at the lake, having arrived with some of his family and his wife Thursday evening. Once everyone got up and feed he was going to meet up with me that day. So I continued on working the boardwalk checking the tree tops and the ground, and everywhere in between for birds. As the morning wore on the sun started to warm the air, and then as I was standing with my bins in my hands I noticed 5 to 6 guys walking rather briskly towards the exit. For myself when I see behavior like this a red flag goes up. So I naturally followed them. Off the boardwalk and across the parking lot towards the estuary trail which takes you onto Ottawa National Wildlife Refuge. 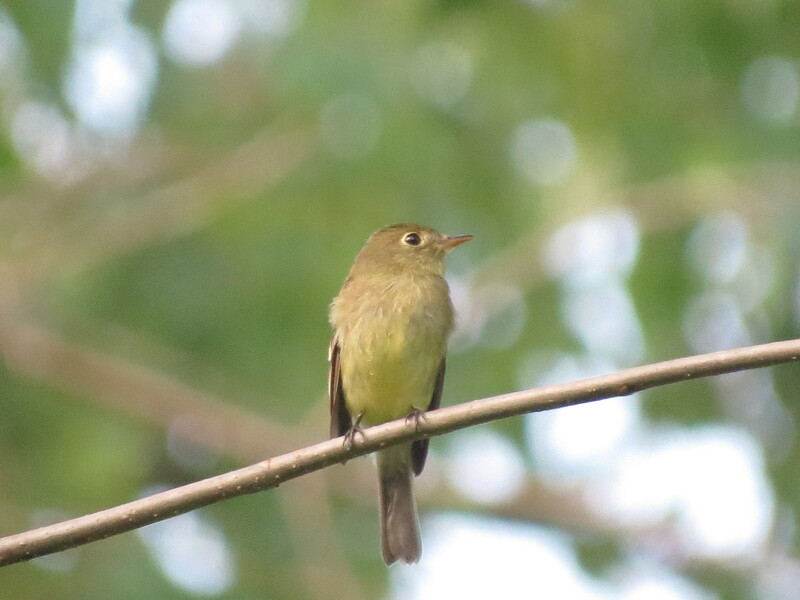 From the chattering of info I was picking up as the group walked along was that a Connecticut Warbler was seen near the trail. Then for some unknown reason the group stopped. They were in a discussion and they all had a confused look on their faces. So I walked up and asked them if they were heading over to see the warbler. They were, but didn’t have a clue that the trail continued on towards the actual estuary where Lake Erie flows into and out of Ottawa and it’s marshes. 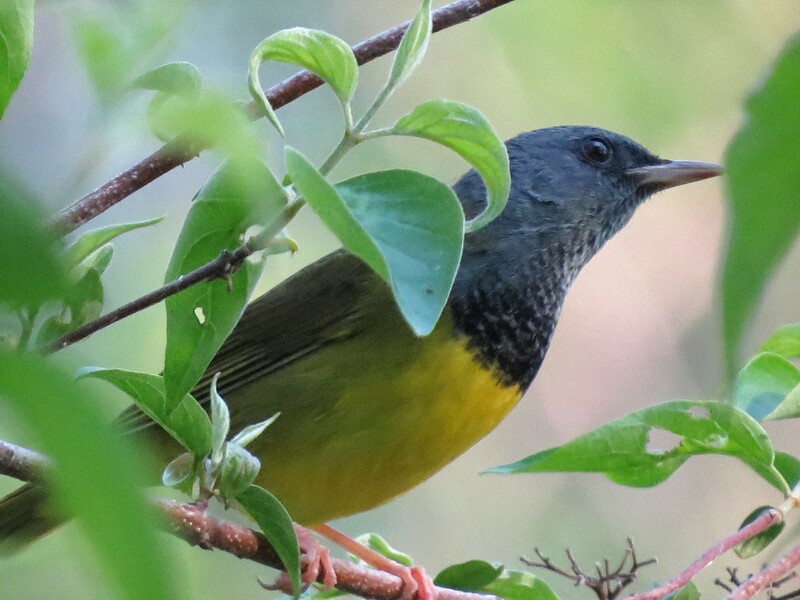 Next to the Connecticut warbler for being the best “skulker” of the warbler world, the Mourning Warbler is a close second. Then it finally showed itself. So I helped them out by pointing them in the right direction, and off we went. The trail is actually the top of a dike that runs parallel to Lake Erie, with the marsh enclosure on one side and the lake on the other. And in between is some pretty thick undergrowth of mature trees and scrubby bushes with lots of leaf litter. Perfect for a Connecticut to hang out in. As we approached the far side of the trail then we saw all the people. Dozens upon dozens, all training their bins downward into the brush. And you know that bird is there, because it keeps singing every minute. 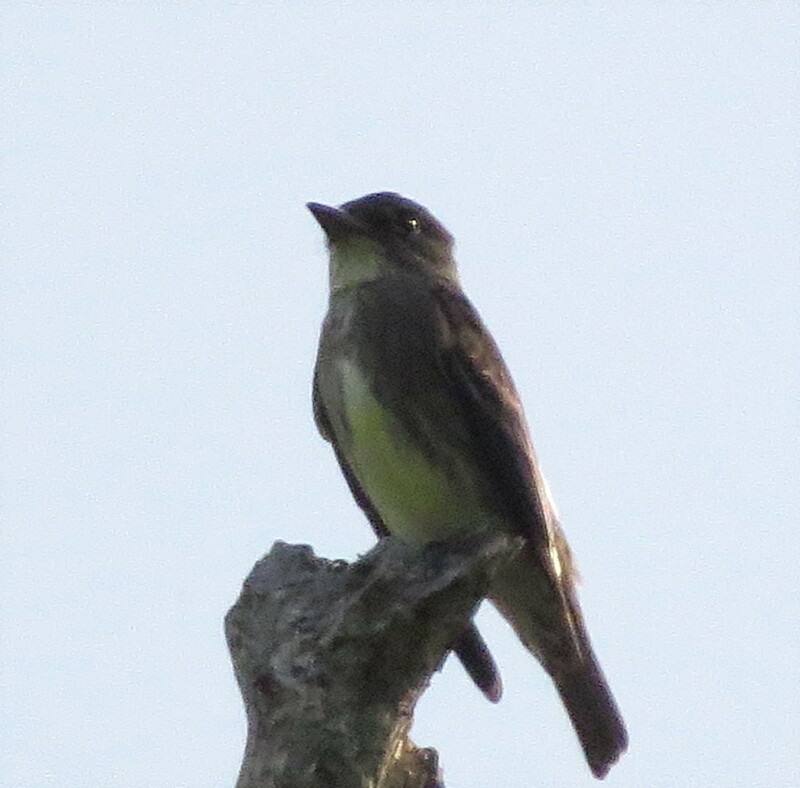 Always a great bird, a Yellow-bellied Flycatcher. I sent Jon a text and filled him in on what’s going on. It’s a lifer for him. 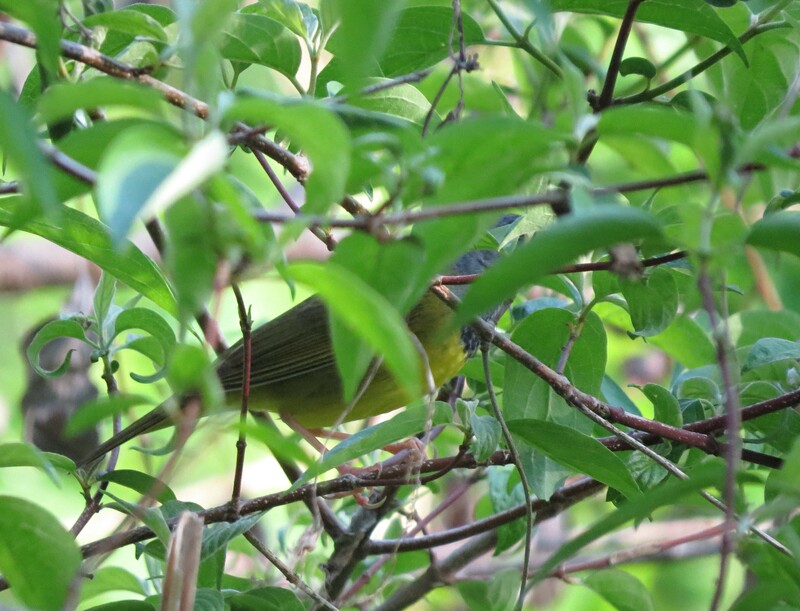 A few people catch glimpses of the bird, then it goes back into hiding. The mass of people swell and then separate into smaller groups to cover more ground. Jon and I scoot 20 feet to the right by ourselves and scan the ground. Since we’re on a small dike we’re a few feet above the floor of the wooded section we’re scanning. A small pool of standing water about 10 feet in front of us. 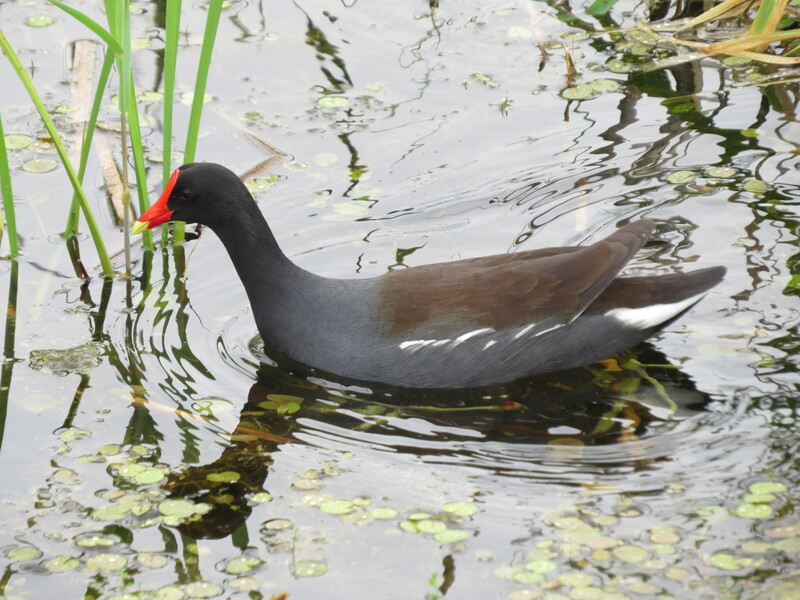 Jon first sees the bird foraging along the edge of the pool. 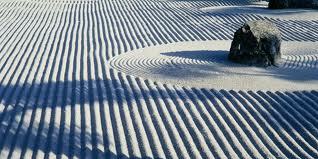 He loses it as it moves away and vegetation gets in the way of our vision. I catch a quick glimpse and say “there it is”. People start to move in our direction as I sit down on the ground and Jon crouches low. Then the bird moves. Lands on a branch at eye level 8 feet in front of Jon and myself. And that quick it was gone. 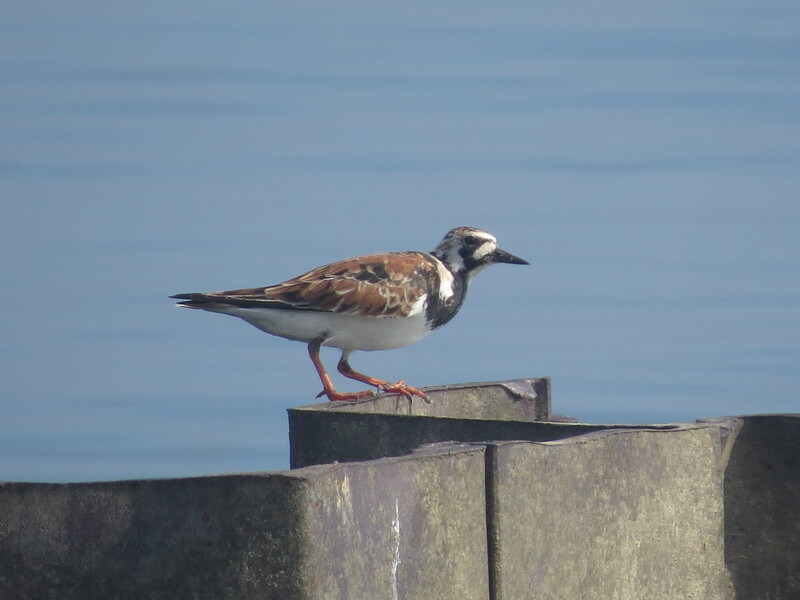 A pretty reliable spot to find Ruddy Turnstones is on these metal breakwaters that run perpendicular to the shore. 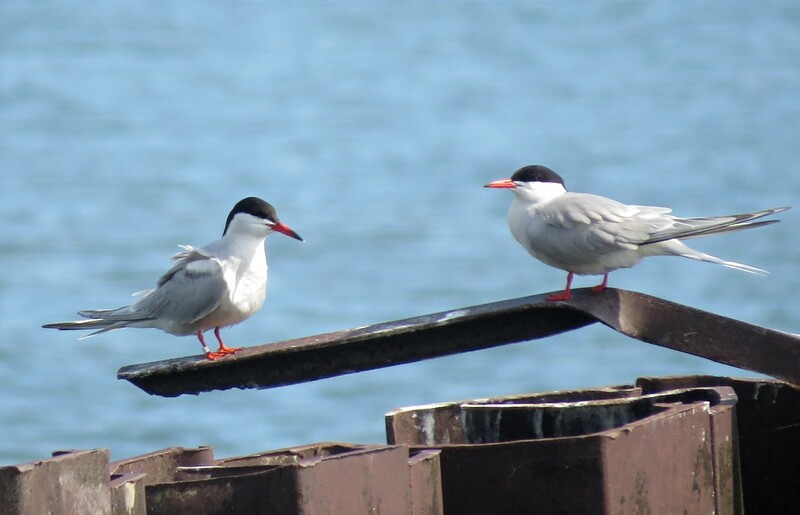 Common Terns also shared the same perch as the Ruddy Turnstones. 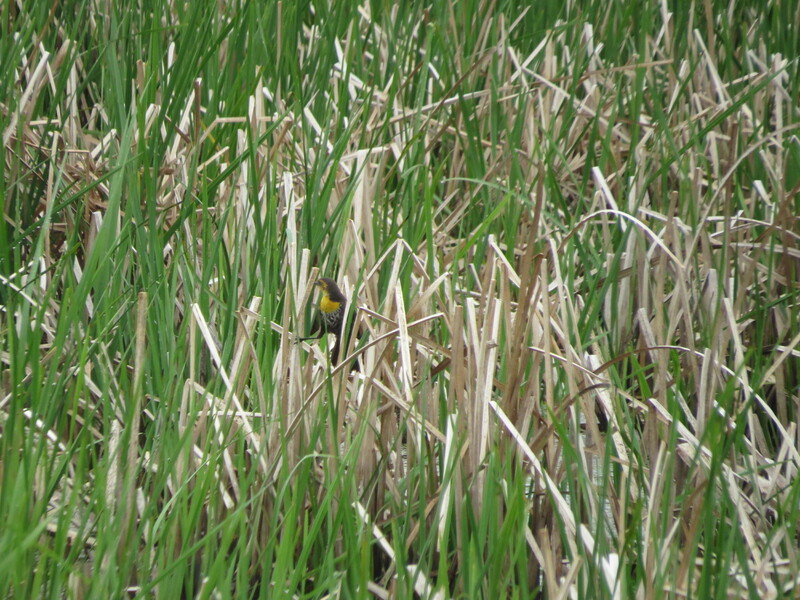 It was a few hours later when I learned that Samantha, Jon’s wife, got a tip on a Yellow-headed Blackbird seen from the auto tour at Ottawa. Not wanting to appear rude or anxious, I said my good-byes and raced off to my car. 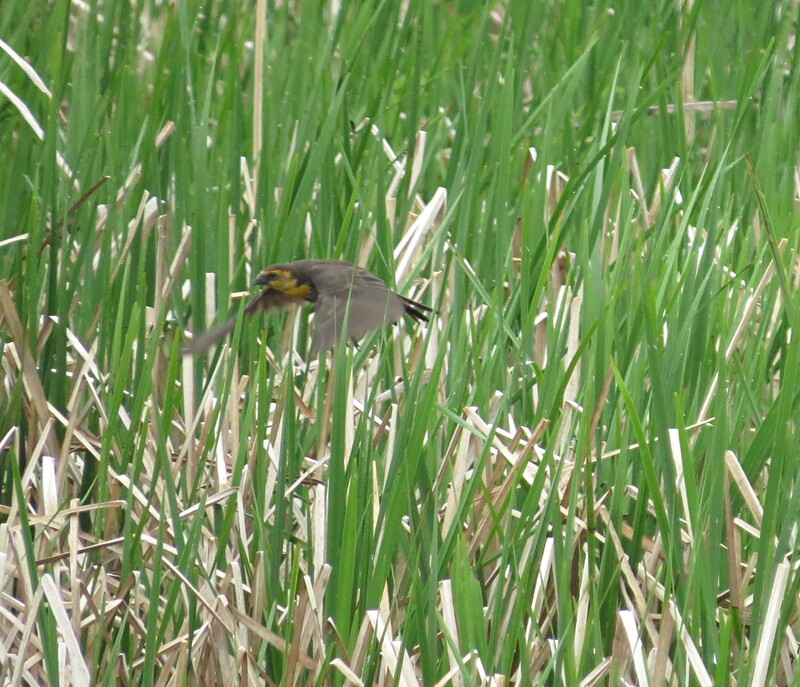 These are the addition pictures of my lifer Yellow-headed Blackbird. The other one was on my previous post. I’m now going to run through the trip list and save my next post for when I went to Ottawa N.W.R. with more pictures. Never in a million years would I have thought I would be coming home with a new life bird. The weekend was tough as far as migrants were concerned. We really had to work for all the birds we sighted, or heard. But this bird is particularly sweet since it’s one of my nemesis birds. For years now I’ve been going to the Magee Marsh, Ottawa N.W.R. 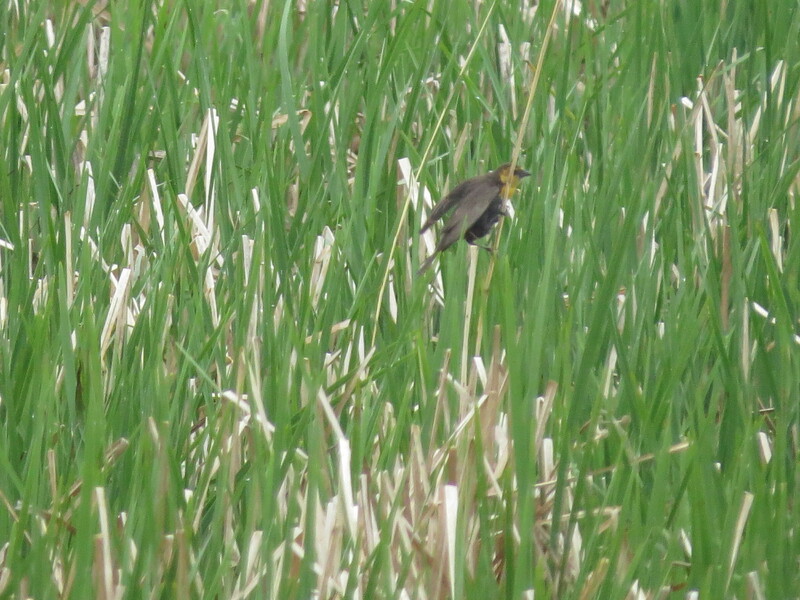 and the Metzger Marsh areas, and I’ve had my share of chasing this particular bird. 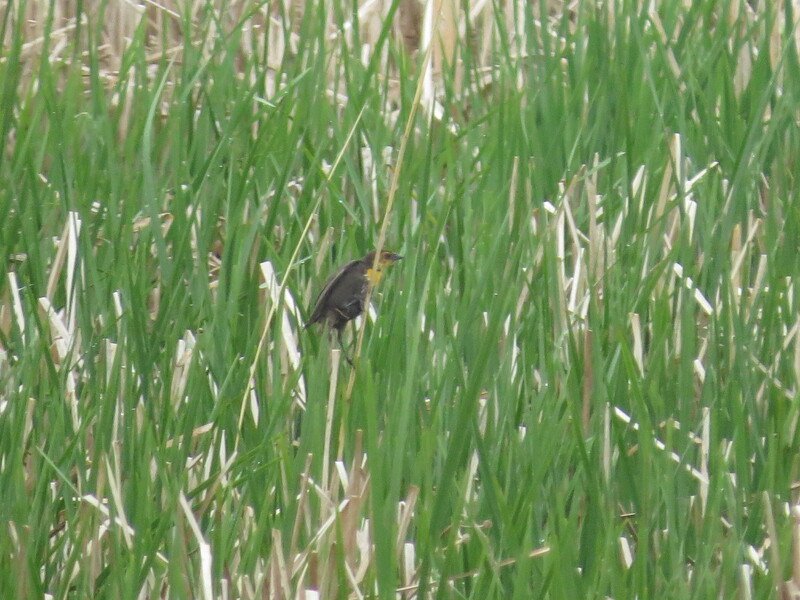 And Saturday after Jon picked up a life bird of his own, his wife Samantha tipped me off on a Yellow-headed Blackbird on the auto tour at Ottawa. I found the spot without any issues. 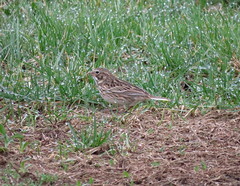 And after just a few minutes up popped the bird, being harassed by several Red-winged Blackbirds. Now granted I’m not a sexist, but a male would have been sweet. I’m not complaining, I’ll take this lifer anyway I can. So after work on Friday I’ll be setting off in an attempt to get to the lake before it’s too late in the evening to get some birding in. Then I’ll have all day Saturday and Sunday Morning and early afternoon to get a little more birding done before returning home. Granted the weather forecast seems dismal with rain most of the time, but that won’t deter me from trying my best to tick off some really good birds. And hopefully get some decent photos. 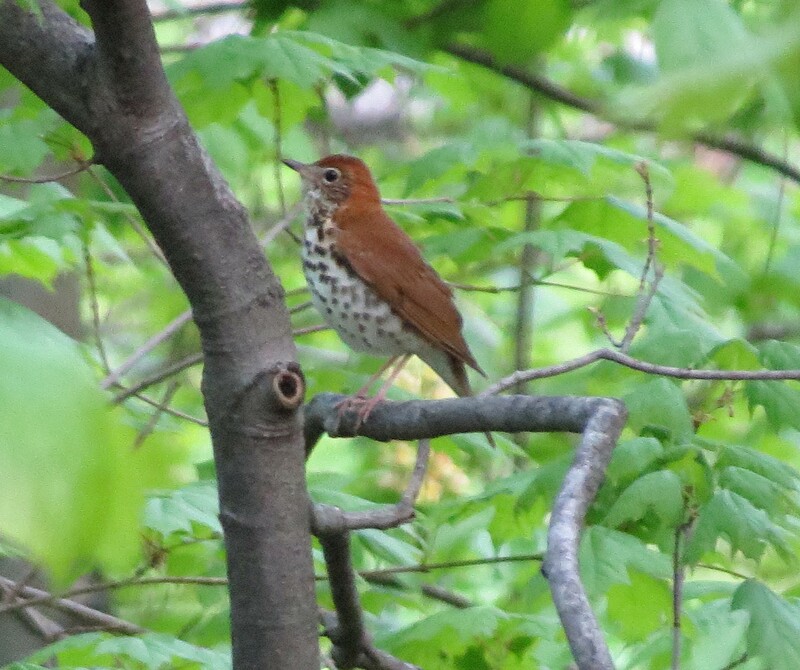 I want to imagine that when I get to heaven that I’ll wake up every morning with a Wood Thrush singing. 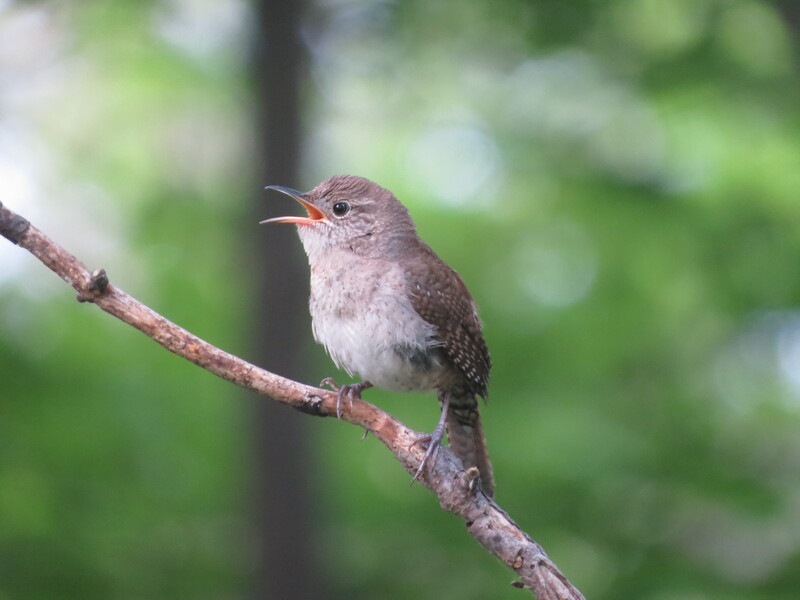 Of all the bird songs I’ve heard so far in my life nothing is as soothing as their song. In the woods all alone and a Wood thrush sings in the early spring morning. Nothing I can think of can compare to the flute like song that echoes all around you. That’s what it was like as I hiked Boone County Cliffs this past Saturday. 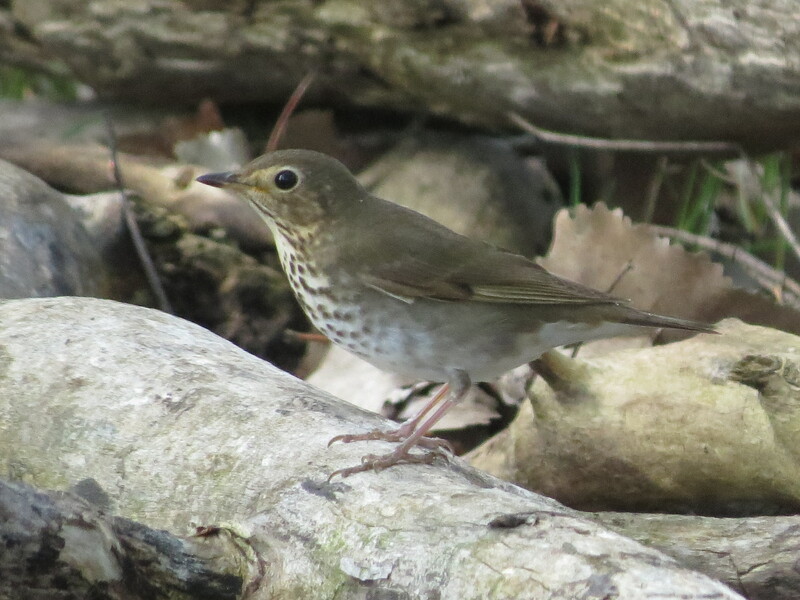 Trying to pick out other species to identify while the Wood Thrush keep up their song is quite distracting. But a pleasant distraction.